BQB EDITORIAL NOTE: It has come to my attention that Dr. Hugo Von Science recently attended one of Presidential Candidate Donald Trump’s campaign events, stole a cup the billionaire drank out of, and successfully spliced The Donald’s DNA with that of a zombie held in captivity. The result? ZOMBIE TRUMP. I thought about reporting this to the authorities but decided it would be fun to just let him review The Walking Dead when the new season begins. Here, Zombie Trump will catch you up on where the series left off at the end of last season. First of all, I want to say that being on this goofball website is completely beneath me. Bookshelf Q. Battler, that nerdy dope, should get down on his hands and knees and thank me for giving his pathetic excuse for a website the highest ratings boost it will ever see. 3.5 readers? I’ll have this joint swinging with 3.5 million readers when I’m done with it. And will that clown appreciate it? I doubt it. I’d ask for a little nibble on BQB’s brain as compensation but I doubt he has one. So let’s talk about those survivors from last season. Apparently, I’m obligated to warn you that there are SPOILERS ahead, because for some reason, people get really whiney when their shows are spoiled. I don’t know why you’re wasting your time with lame zombie shows anyway when you should be checking out the luxurious Zombie Trump Taj Mahal. Try your luck at the craps table, then get eaten and turned into literal zombie crap. Oh and the buffet is all you can eat for $9.99 so really, there’s not a better deal around. Look, I know a lot of ladies think he’s hot and handsome but I’m telling you, this guy is a total loser. If you ask me, I’d rather have a Sheriff that can actually bring the bad guys in, not crash his car while in pursuit and end up in a coma during the zombie outbreak when he’s needed the most. Seriously, how am I supposed to trust this guy to lead when he couldn’t even keep his best friend Shane from slipping his wife the old one eyed salamander? Last time we saw Rick, he was abusing his authority as a newly appointed Sheriff in the settlement at Alexandria. Beat a guy up because he wanted to get hot and heavy with his wife. Making plans to take the community over if things don’t go his way. Classy? I don’t think so. Sorry Rick. I wouldn’t hire you to guard the Zombie Trump Golf Course. Eighteen links of pure zombie fun. Yeesh! Look at that face! Is that the face of a woman that you want to see in your zombie apocalypse survivor’s group? I don’t think so. Oh what? What? I was just talking about her record. She’s actually a beautiful woman. Although if we’re getting into it, a little bit of blonde hair dye wouldn’t hurt her. Make her up to look like my first wife, Zombie Ivana, or my second wife, Zombie Marla Maples. But let’s talk about this gal’s record. Killing a kid? Threatening to kill another kid? Sure she’s able to lull her enemies into a false sense of security by fooling them into thinking she’s just a dowdy old homemaker only to strike when they least expect it, but you know what I’d tell her if she worked at the Zombie Trump Casino Day Care Center? Who is this loser running around on a motorcycle with a crossbow like he’s some kind of hillbilly heart throb? Look Jethro, a shave and a haircut never hurt anyone. I’ll give you the number of my personal stylist. She’s does great work. Just look at me. Glenn, we gave you one simple task. Keep that Noah kid alive. You failed. I know you tried your best but best doesn’t cut it. Sorry, I know this is harsh, but as punishment, I’ve banned you from all Zombie Trump resorts and associated properties. Not gonna lie. This man had a lot of moxie. I was sorry to see him go. He was a real take charge kind of guy. Even with one eye he was able to see two or three moves ahead. Best character on the entire show. He built a wall around his town and if you ask me, building a wall is an idea my fellow zombies and I should try. My fellow zombies, for far too long we’ve suffered at the hands of these lousy human survivors. We build up our zombie communities and in they come, putting arrows in our brains, taking our zombie jobs. They’re rapists, murderers, and SOME of them, I assume, are good people, but we just can’t allow the influx of doomsday preppers, hillbillies, and other assorted human survivors to invade our territory any longer. So I propose that we build an enormous wall to keep the zompoc survivors out. 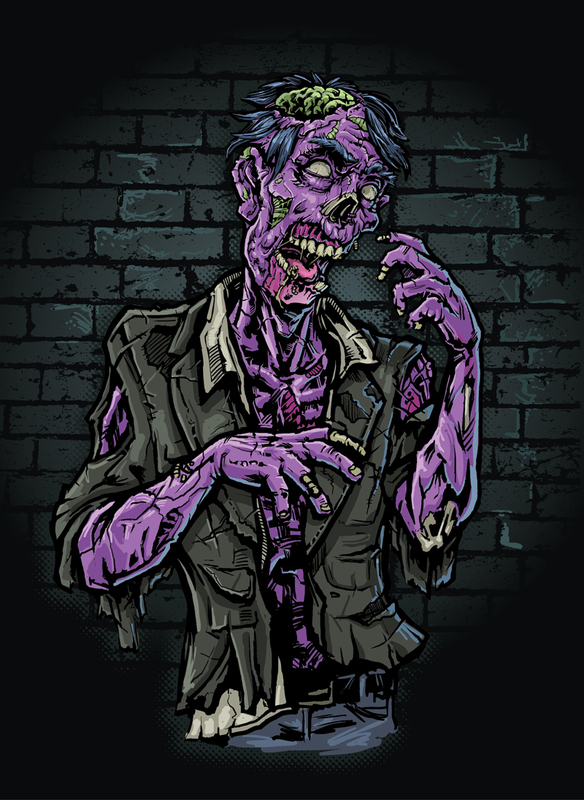 Elect me as President of All Zombies and I assure you on my first day in office, not only will I build a giant wall around all zombies, but I’ll make those loser humans pay for it. BQB, you’re welcome. You didn’t even deserve an appearance from me on your stupid blog but you got one anyway. IT’S GOING TO BE HUUUUUUUUUUUUGGGGGE! I’d eat all 3.5 of your brains but I’d probably go hungry. Mic drop. Zombie Trump out. Possibly. I try not to get political but I do need someone to review The Walking Dead while I’m indisposed by the East Randomtown Zompoc and Trump’s style is hard to resist, imitation wise.